Ben Bidwell, a Ford Motor Co. executive who later helped guide Chrysler's revival in the 1980s, died Oct. 14 at age 84. Bidwell railed against Detroit's insularity, lambasted the press as "congenital sickos," and raised the specter of a Japanese-dominated America at various times during his 37-year career. He worked under two of the industry's biggest personalities of the day: Henry Ford II and Lee Iacocca. He started at Ford in 1953 and rose to general manager of Ford and Lincoln-Mercury. In 1978 he was named vice president of the Car and Truck Group for Ford's North American Automotive Operations. 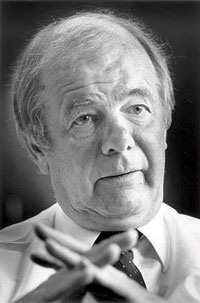 Bidwell left Ford in 1981 to become president of Hertz Corp. until 1983. That year he joined Chrysler Corp. to steer sales and marketing as the company was preparing to introduce the Dodge Caravan and Plymouth Voyager minivans. They would help Chrysler nearly double U.S. sales within six years before the industry skidded into another recession. In an interview with Automotive News upon his retirement, Bidwell said Henry Ford II worked harder "than other people might have if they had been born Henry Ford." Speaking of Chrysler CEO Iacocca, Bidwell noted: "The most amazing thing about the guy is that he just never gives up," Bidwell said. "Every day he gets up and every day he attacks. You get discouraged yourself. But he just never, never, never gives up on the company, on its products, on whatever. And I think that probably is a good thing for me to have been exposed to." In the same interview, he said his favorite period of his career was working with Lincoln-Mercury dealers as head of the division from 1970 to 1973. "I had died and gone to heaven," he said. "We had a thousand dealers and I think I knew every one of them by their first name. We were doing well, and it was a lot of fun." Bidwell retired as chairman of Chrysler Motors Corp. on Dec. 31, 1990. He was awarded the Automotive Hall of Fame's 1989 Distinguished Service Citation for his contributions to the automotive industry. In a 2003 interview with Automotive News, Bidwell was asked what he would like to people to remember about him. His answer: "Leading the crusade in the late 1970s that ultimately eliminated the 10-day sales report." Bidwell and many others in the industry thought the brief 10-day period overemphasized statistical blips that often misrepresented longer-term sales tends. Automakers now report on a monthly basis.